DECK-O-SEAL, a division of W. R. MEADOWS, INC., offers the concrete pool construction industry a complete line of self-leveling and non-sag, single and two-part, polysulfide joint sealants, plastic deck drainage systems, and decorative concrete sealing compounds from twelve factory-owned locations, plus distributors throughout North America. To ensure a quality application, make sure that you always purchase DECK-O-SEAL from an authorized distributor. Find the closest authorized distributor in your area. Homeowners: Ask for the DECK-O-SEAL line of products by name at your local pool retailer. DECK-O-SEAL offers unsurpassed product availability, with eleven production facilities and warehouses and numerous distributors throughout the United States and Canada. To find the location nearest you, click here. 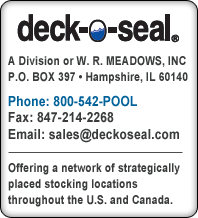 View the entire line of DECK-O-SEAL concrete pool construction products, Click Here. For additional concrete construction and waterproofing products, please visit our parent website: W. R. MEADOWS, Inc.
DECK-O-SEAL e-Newsletter and stay up to date on DECK-O-SEAL news. 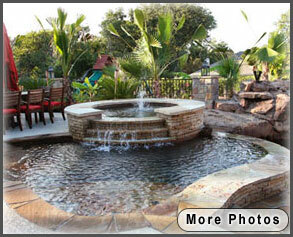 We offer a complete system to protect, enhance, and beautify your pool deck, walkway, or patio. The DECK-O-SEAL line of pool deck products has expanded to include sealers used to seal your decks, copings, and waterfalls. For use with concrete, brick pavers, natural stone, or decorative concrete.